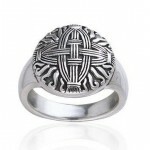 Modeled after the rush crosses made to honor St Brigit on Imbolc, this sterling silver ring has beautiful detail. Brigid's cross or Brigit's cross (Irish: Cros Bríde, Crosóg Bríde or Bogha Bríde) is a small cross usually woven from rushes. Typically it has four arms tied at the ends and a woven square in the middle. Historically, there were also three-armed versions. It is suggested that the cross has pre-Christian origins and is related to the sun cross. Brigid's crosses are associated with Brigid of Kildare, one of the patron saints of Ireland. The crosses are traditionally made in Ireland on St Brigid's feast day, 1 February, which was formerly celebrated as a pagan festival (Imbolc) marking the beginning of spring. Many rituals are associated with the making of the crosses. Traditionally they were set over doorways and windows to protect the home from any kind of harm. Please note this item is made to order so allow extra time for delivery. It generally ships within 2 weeks though can be longer during holidays or other peak seasons. Ring is about 5/8 inch high at the tallest point. Item Number: PS-TRI241 | Approximate Size (Inches): 0.50 wide x 0.01 deep x 0.50 high | Approximate Shipping Weight: 0.25 lbs.